Exercise, intellectual stimulation, surgery, meditation or detox – you name it, we love it. Let’s face it, we live in a society obsessed with staying young. So, when you mention to someone that bingo may well be a key to youth, the image of pensioners playing in a retirement home may well prompt them to ask a few questions. It’s not chess or bridge, but researchers insist that bingo can keep your mind trim and bring more to your youthfulness than just cash prizes and idle chitchat. Bingo players who have been playing bingo for a sustained period of time have been found to have superior reflexes in many cases to non-bingo players. The speed and mental agility required to scan six bingo cards in time before the next call is certainly better than stagnating in front of the television and has been responsible for keeping the minds of many people of different ages fit and healthy. As we get older, the blood begins to run at a thinner rate to the brain. Using our brains less can result in a decrease of mental agility and flexibility. Playing bingo is an enjoyable way to keep those attributes intact. The competitive spirit of the game is also something that helps to regenerate our bodies when we take ourselves out of the workforce. The experience of retirement can very much and rightly so, equate to slowing things down. People take things at a far more leisurely pace. This is what is so attractive and something many look forward to after a fast-moving career. The only problem is that as we do that, so we lose a sense of the invigoration that the competitive energy used to spark. 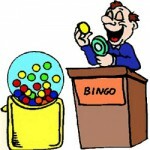 The great thing about playing bingo is that it is able to reignite that spark, depending on where you are playing. Certain bingo halls can be notoriously competitive. Players have developed ways of managing to cope with as many cards as possible by turning them upside down, paying for someone else to keep an eye on them and even continue other activities, such as knitting while the game is in play. The callers can move relatively quickly and you have to stay on your toes in order not to miss a call or a number. To many, this competitive edge and speed aspect is so vital to the maintenance of their energy and fighting spirit. It keeps all of the senses in a sharp shape and forces the player to sustain some of the efficiency and rigour they may have been used to when working or even when their bodies may have had slightly more endurance than they do now. Players have to stretch themselves to the limit and keep the competitive flame burning by the allure of large cash prizes. The social aspect of the game is crucial as well. It is the combination of the interaction and communication so prevalent in the bingo halls with the mental agility and stimulation that many suggest can contribute to the prevention of depression. Depression is something that becomes more and more of a concern as the mind begins to deteriorate. People find they are unable to stimulate themselves as they used to do and hence become very frustrated and bored. Therefore, the sustenance of mental stimulation and optimum functioning is so important to a balanced state of mind.